I made this salad a couple of weeks ago and I wanted to make sure I shared it before the summer ends! The recipe comes from the summer issue of Food Network Magazine, which I love reading. I must have passed over this recipe when I first saw it in the magazine, but then when it appeared on Perry's Plate, it suddenly became much more appealing and I knew I wanted to make it! This is a cold rice salad that uses a mix of grains, a light dressing and a combination of fresh ingredients that make it a healthy and refreshing summer meal. 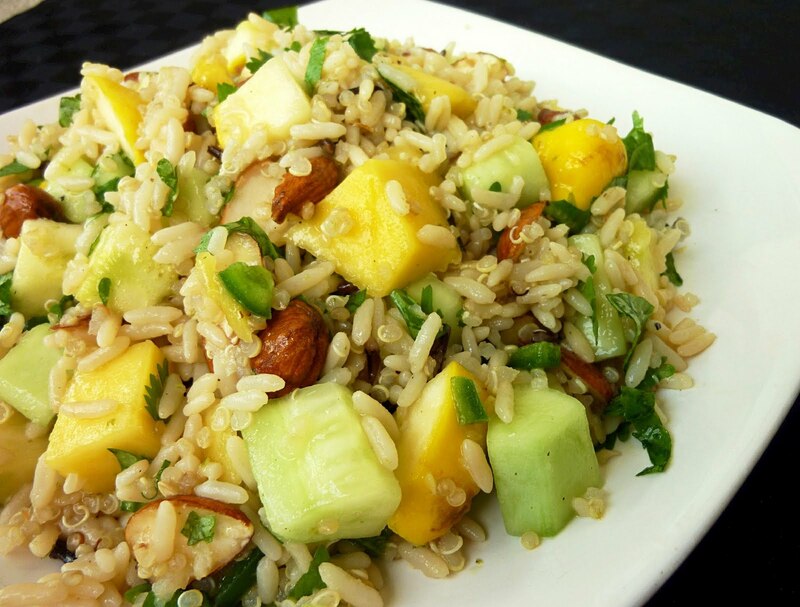 In addition to the mango and cucumber, I added some raw pattypan squash - I saw it at my local natural food store the day I planned on making this salad and it was so adorable that I had to buy some! The salad would still be great without it, but I liked having an extra vegetable in there. If you're looking for a nice summery dish to make this Labour Day weekend, I recommend this recipe! It would also be great to bring to a potluck or a BBQ as a side dish because it makes a large amount. First, cook the rice and quinoa. If you are using microwaveable rice: Cook the rice according to package directions. Bring a small pot of water to a boil on the stove. Add the quinoa and reduce heat to low. Cook for about 15 minutes, then turn off the heat and let sit for 5 minutes before lifting the lid and fluffing the quinoa with a fork. If you are not using microwaveable rice: Bring a large pot of water to a boil. Add the rice and cook about 15 minutes. Then add the quinoa to the water and cook an additional 15 minutes. When the rice and quinoa are done cooking, drain and spread out on a baking sheet or shallow dish. Put the dish in the freezer to cool down. Meanwhile, whisk together the lime juice, zest, oil, agave, salt and pepper in a small bowl. 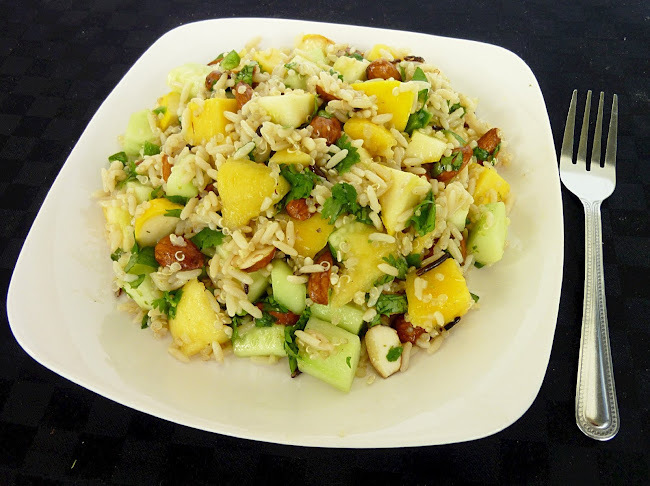 Prepare the remaining ingredients (mango, cucumber, squash, jalapeno, nuts and cilantro). When the rice and quinoa have cooled, transfer them to a large bowl. Add the remaining salad ingredients and pour the dressing overtop. Toss to combine. Refrigerate until ready to serve. Season with additional salt and pepper, and a squeeze of lime juice when serving if desired. This looks super healthy and I love the pattypan squash - so adorable!